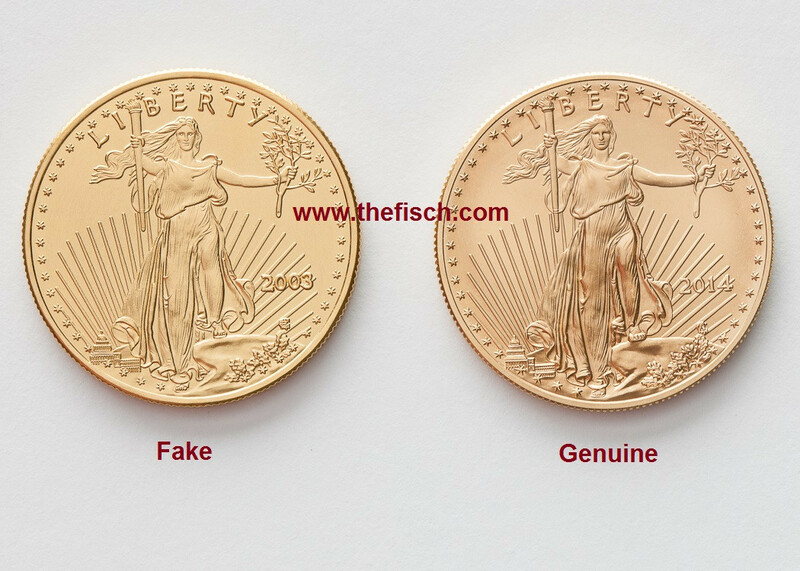 Fisch News: Warning: Tungsten Counterfeit Gold Coins - Dont buy fake gold coins. Get the Fisch. Protect your gold investment. I have recently obtained 3 tungsten based counterfeit gold coins, a Krugerrand, an American Eagle and a Maple Leaf. All are 1oz. Previously, the tungsten fakes were poor imitations of the real thing, these are the best I have seen. When examined side by side, the different color and lack of details is noticeable but they are a real threat to the unaware and careless. The Krugerrand and the American Eagle are the correct weight and size; the Maple Leaf’s diameter is too big. It does not pass through the slot of the Fisch. It is also slightly out of round but only apparent from careful measuring. For some time now, we have been working a simple method of detecting these fakes as an addition to the checks done by the Fisch. Called The Ringer™, the new tool rings the coin. A 916 fine gold coin has a long distinct ring when struck; 999 fine gold a less distinct ring but a tungsten fake only produces a dull thud. While the major concern is tungsten fakes gold coins, the Ringer can also be used to detect common metal silver fake coins. The Ringer must be used in conjunction with the Fisch for optimum protection from all fakes. The price of the Ringer when ordered with any Wallet and for Fisch Family members (customers who have the Fisch already) is $39. This is $50 off the regular price of $89 for the Ringer when ordered on its own. All plus shipping. And sales tax in California. The Ringer is supplied with a full set of instructions for the Gold and Silver Fisch (reworked) and the Ringer. Also included is a holder for the Ringer that fits within the rings of the holder. Plus Travel Pouch instructions and Contents insert, too. If the Ringer is bought with the Fisch, a 3-ring holder will be included if needed. The instructions are improved. They are matte laminated to make them more durable, especially where they get chafed at the holes for the rings. At the suggestion of a user, I have increased the size of the holes as well. It is a complete upgrade of your counterfeit protection system for ALL common metal and tungsten fakes.